A small group of protesters gathered outside a McDonald's restaurant on Chicago's west side Tuesday morning to lobby for more training and protective equipment that would protect injury, primarily burns. The demonstration inside and outside the restaurant, on the 3200 block of West Roosevelt Road, comes one day after employees around the nation filed 28 health and safety complaints against the Oak Brook-based company. "We don't have any actual cream or Band-Aids or none of that, so if you get cut, that's it. Or if you get burned, mustard is the treatment," said employee Adriana Alvarez. 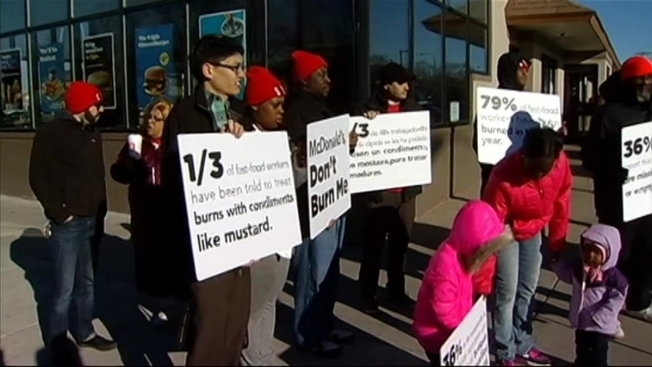 Protesters marched with signs in English and Spanish that read "McDonald's, Don't Burn Me" and others that alleged employees have been told to treat burns with condiments. The complaints were filed with the U.S. Occupational Safety and Health Administration. The federal agency said it would investigate the allegations. A statement from the McDonald's corporate office said the restaurant and its independent franchisees "are committed to providing safe working conditions for employees in the 14,000 McDonald’s Brand U.S. restaurants. We will review these allegations." Spokeswoman Heide Barker Sa Shekhem added that the company believes the complaints are part of a larger strategy to tarnish the McDonald's brand. The protest was organized by the group "Fight for 15," which has held a number of demonstrations around the country to push for a $15 per hour minimum wage.